This was originally an e-mail to one of my regular brainstorming partners, but I thought I’d kick it to the group. 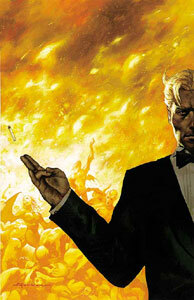 As part of my angel kick, I re-read Vertigo’s Lucifer. Lucifer is the adventures of the former devil as he tries to escape the predestination he believes has been inflicted on him by his father. It’s a neat combination of grand mythology, bastardly trickery, and street level stories about ordinary people getting mixed up in the supernatural. Reading got me to thinking about one of the problems in roleplaying games that I’ve never been able to solve: how to handle characters whose powers are only loosely defined, like a lot of the characters in Lucifer and Sandman. In Sandman, Dream himself is well-modeled by Nobilis. He has the power to shape, create, and destroy dreams, and he has absolute control over reality within his own realm. Other characters are a little harder. The ability to bind and bring back anything he kills. The ability to conjure or control fire in any context. The ability to kill mortals without physical action, including at a distance or in vast numbers. The ability to grant souls to the soulless. The ability to use sympathetic magic for a variety of minor effects. The ability to travel anywhere, inside or outside of Creation. The ability to shape the raw energy of Creation into a multiverse. The ability to permanently remove someone’s sexual potency. And others. The general problem with modeling him in a system is that these abilities seem to occur to Lucifer’s “player” on the spur of the moment. If one were running a game of grand mythology, it would work against the spirit of the thing to have made an absolute list in advance. It’s one of the problems with most games about gods and angels… the powers don’t allow enough on-the-spot effects. The amount of effort involved in the act. It seems to be possible to exhaust gods and such. But what’s the scale? So it seems like a game about higher powers needs some system for characterizing those powers without specifying individual abilities. The mechanics need to keep characters on theme more than provide a strict palette of options. And then some kind of a resource system that tells you how much you can do in the way of miracles and how much a given miracle costs. Nobilis 3e, despite not being quite the right system for the task, seems to point the way. So from freedom, one might get the powers of flight and cosmic travel. From being God’s lamplighter, fire and shaping. From the Devil, the ability to levy small curses. How do you model the tendency of fictional characters to pull off their biggest feats towards the end? What are the points of reference on the scale? 0: Make something happen that could have happened anyway. You don’t have to roll for it. 1: Perform a miracle that only affects an individual person or something small. 2: Perform a miracle that affects many people or a large area. 3: Perform a miracle that changes the nature of reality outside the parameters of cause and effect. 4: Perform a miracle that affects an entire world. Additional difficulty would apply if the effect you’re trying to cause doesn’t relate to one of your Properties. And then there would also have to be physical combat, because what are angels if you can’t wrestle with them? Maybe a pool system, where you have so many points in Do Amazing Things, and there are enough examples of different point levels of Amazing Things to give a good feel without tying everything down? Maybe a given Amazing Thing is subject to peer review around the table – “I dunno, striking someone blind feels more like three points than two”. And for saving the big blast to the end, maybe a system where you have to track up per adventure – you can only use the two-point power after the one-point? Yeah, I think you’re moving in the right direction. As for saving the big blast to the end, it might be worthwhile to separate out resources, like Unknown Armies does. You have a pool of Lesser Amazing Things and a pool of Greater Amazing Things. People will naturally tend to horde the Greater pool for later in the game, and can do as many Lesser Things as they want without compromising that. I think you’re definitely moving in the right direction with your Nobilis comparison, but Lucifer et al aren’t on the level of Powers; I’d say they’re on the level of Imperators. A lot of what he does could be achieved reasonably easily with Imperial Miracles, which require some amount of ritual to bring about but can have creation-spanning effects. The restrictions on what you can do with them are rather interesting; every Imperator has a ‘map’ of their personality, their drives, and their goals, and every miracle they bring about has to flow naturally from that. So essentially you have your foundation of who the character is, and the powers naturally flow from that. A way to stop the Big Amazing Thing being deployed too early would be that it costs something other than Big Amazing Thing points, like temporarily lowering an important stat? It would replenish after the adventure or a suitable break in an adventure (like Willpower after a good night’s sleep) but a player would save a super-attack for the end if it halved their Strength or blinded them or something like that for the rest of the session.